Every person has their own reason for wearing leather vests. How you will wear your vest will determine how it should fit. 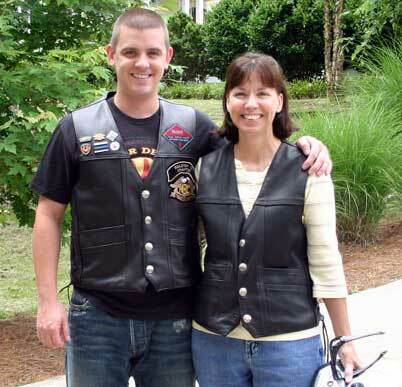 Brent and his mom sporting our Buffalo Nickel Vests! Most riders just want a motorcycle vest they can wear in the summer in lieu of a leather jacket. The main difference between our leather vest styles (other than the look) is solid sides vs. laced sides. One advantage of laced sides is the laces can be loosened up to let the air flow through. To get the best fit, you should take your measurements over what you normally wear when you ride. A leather vest with laced sides allows you to wear heavier clothing by simply loosening the laces. If you prefer a vest with solid sides be sure to take your measurements over your heaviest clothing. Many people enjoy a snug fit with the laces tied tight. Others prefer to have the laces open. There’s no right or wrong there. Our leather vests are designed to come to your belt line when standing. Some people prefer longer, some prefer shorter. The key is that it’s long enough to cover your back and short enough so the shoulders don’t push up when you are seated. We work with several motorcycle clubs (ask us about our club discount). Fox Creek Leather has several leather vests that accommodate club colors more easily due to a full back, or one piece back. If it’s important to wear your leather vest over your motorcycle jacket, it may be hard to get a good fit both ways. In general, to fit over your motorcycle jacket you’ll need to go up 2 sizes in the vest which then may be baggy when wearing it just over a t-shirt. We recommend your vest fit you over what you’d normally wear and then you can add vest extenders to wear the vest over your jacket. Vest extenders are easy to use and look cool, too. Sometimes customers need to get a larger size or a longer size to accommodate their “beer belly”. No shame there, it happens to the best of us. But that’s why we ask for your stomach measurement when you order. You should take that around the widest part, again, over your clothing. As always, we’re here to help. Don’t hesitate to contact us with your questions.